These mugs are made in the USA by American Glass Workers. Our other mugs include political party mugs, 57th Presidential Inauguration mugs, and historical White House mugs. We even carry military mugs that are perfect for military family members, veterans, and active duty alike. Our White House marbled mugs as well as all glassware (see our Glassware section) can be customized with a name, organization, event, or special message for a nominal cost. For customization advice and pricing, simply send an email to rachel@whitehousegiftshop.com or call 877 896-3609 (please leave a message if your call is after hours). Shop our special Presidential mugs to find that unique gift or collectible. We have mugs that feature the Presidential Eagle with special engravings. 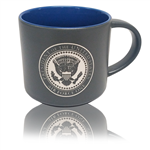 Browse our wide selection of mugs to find the perfect Presidential or White House gift!